Whether you’d prefer the consistency of having your dental professional administer treatment, or rather take a product home, there are effective teeth whitening solutions for you. Dr. Narges Rashid, Dr. Joel Ross, and our caring staff at Westford Dentistry strive to improve your smile’s aesthetics by providing professional teeth whitening in Westford. Contact our office today to schedule your appointment. When important life events such as a wedding or a family gathering come up, many dental patients want to bolster their smile’s appearance so they can look their best. For others, improving the shade of their teeth before having a crown affixed provides appealing uniformity. With the multitude of over-the-counter teeth whitening products found at the pharmacy, it can be difficult to find one that provides the desired results. Our doctors eliminate the guesswork by offering Opalescence® professional grade whitening products by Ultradent. Teeth can become discolored for a variety of reasons. More commonly, consuming darker colored beverages such as coffee, tea, or wine can stain the outer surface of your enamel, especially when not following a consistent oral health routine. Additionally, tobacco is an especially potent stain-producing product, negatively impacting the brightness of the smile. Treating surface stains with a proven bleaching gel efficiently improves the color of your teeth by multiple shades. Our doctors make every effort to accommodate patients, which is why we offer Opalescence in two convenient methods. The chairside option allows a trained member of our staff to administer treatment, beneficial to those who want the whole process taken care of in one visit. 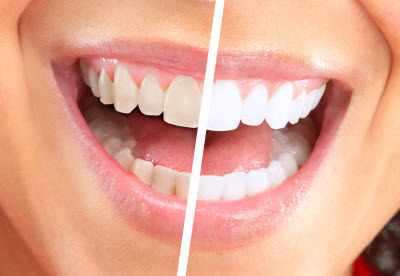 We are careful when recommending in-office teeth whitening because of the product’s strength, as some who undergo this cosmetic enhancement experience discomfort from the hydrogen peroxide. Opalescence’s bleaching gel has a solution called potassium nitrate that helps alleviate some of the sensitivity involved with the procedure. Our dentists can also provide you with a prescription toothpaste to use prior to and after treatment to further reduce discomfort. Opalescence’s convenient take-home option gives patients the chance to improve their appearance at their own convenience. The 10-day kit uses custom trays to whiten your teeth by several shades. This cost-effective method is beneficial as a standalone or a follow up to professionally administered treatment. Dr. Rashid and Dr. Ross understand how achieving a bright, white smile can help patients feel more confident in their daily life. This is why our dedicated team at Westford Dentistry proudly offer both in-office and take-home options of teeth whitening to Westford, Littleton, and Chelmsford. Call us today for our quality cosmetic services!